Well, things on the writing front were delayed this fall by moving houses and a death in the family. But, the good news is I’m back to writing and excited about what is coming up! My novella, When Mary Met the Colonel, is finished. I’m working on the cover and formatting now and it should be out soon. As you might guess from the title, it’s about Mary Bennet and Colonel Fitzwilliam. It’s my first P&P variation that doesn’t focus on Darcy and Elizabeth (although they’re part of the story), so I’m looking forward to releasing it! I’m hard at work on my next novel, which looks like it’s going to be a long one. I finished the first draft this weekend, but that means there are at least two more drafts to go. 😦 On the other other hand, the hardest part (writing the first draft) is finished and it’s just editing and polishing now. This novel is a P&P variation focusing on Darcy and Elizabeth. I don’t want to say too much about the plot since things might change. But I can tell you that it follows almost the entire plot of P&P (unlike all of my other books which have started after the ball at Netherfield or later), and one big change from the original is that Darcy’s father is alive–which makes for some interesting character dynamics throughout the story. I’ll keep you updated on my progress! 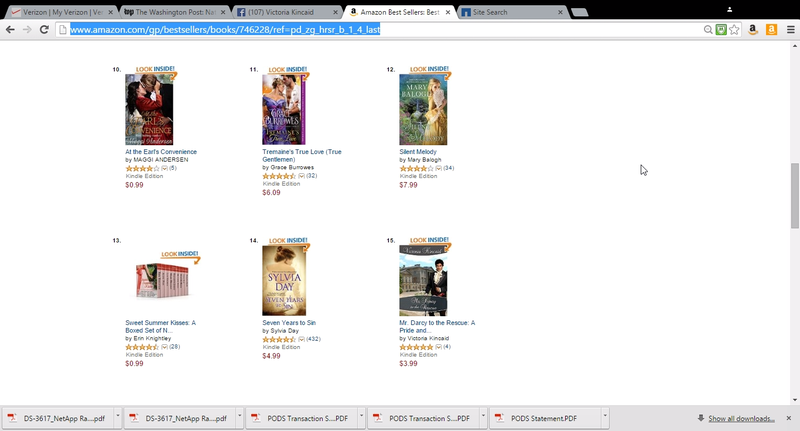 Mr. Darcy to the Rescue is #15 in Regency Romance Bestsellers on Amazon!